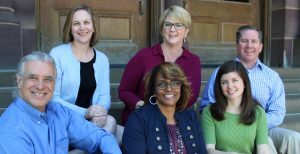 The CETE Results Management Team in the College of Education and Human Ecology provides a range of evaluation services for Ohio State faculty and staff along with outside entities. Since 2002, RMT has designed and successfully implemented millions of dollars worth of evaluations for grants across health, education, and workforce development. Even the best planned project needs to be evaluated. RMT’s evaluation process enables the collection and analysis of both quantitative and qualitative data. Ohio State University faculty, research scientists and staff apply for and receive numerous competitive awards each year. Many of these awards have formal evaluation requirements which are distinct from research or product development. Evaluation is designed to generate information about how well the research or product development process worked and/or to assist in producing information about how to improve a specific product or intervention. The Results Management Team is prepared to assist you in all phases of the evaluation enterprise from logic model development to outcomes definition to the implementation of formal evaluation studies. To contact us regarding your evaluation needs, email results@osu.edu or call 614-292-0175. We also employ OSU students as assistants for some of our evaluation projects. Undergraduate and graduate level assistants can expect to learn about our unique style of evaluation and get real-world experience across a range of evaluation projects associated with health and human services, community based participatory research, and more!